Happy Home-iversary! Last Dec. 20, we got the keys to our new house. We watched it grow from July onwards from vacant lot to foundation to sticks to shell to finished house. We were able to pick out all of the surfaces and colors and fret over whether we would still like them when we saw the finished product. I made a trip from work to the homesite each day and took photos, with the goal of animating them into a cool video. That has yet to be done! 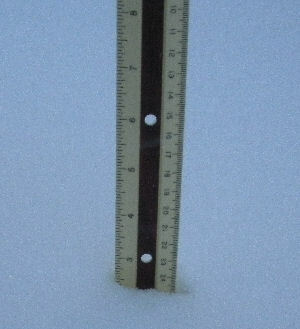 Today I measured the snow at 1 pm and we had 1.5 inches. By 4 pm we had about 2.5 inches. It is dry cold snow, with freezing rain predicted tonight and tomorrow. I shoveled the driveway and porch last night and twice today. Our driveway faces north and therefore doesn’t melt off easily. I baked cookies and lasagna, and we’ll be having a bottle of Maysara Delara Pinot Noir 2002. The only local ingredients in the cookies are organic brown eggs. For the lasagna, I used Nonna’s Noodles lasagna from the farmers market, grass fed La Cense hamburger, my homemade pesto, and some kale and chard still left from my CSA share. I also still had edible salad greens from the CSA. It’s amazing how much longer those last than commercially packed lettuce. Then settling in to watch DVDs and just be snug and happy.